The days of having to drive to Tulsa to see your favorite band may be over. Band after band I have wanted to see live skips Oklahoma City only to go up the turnpike to Tulsa to perform. Well, all of that is about to change. 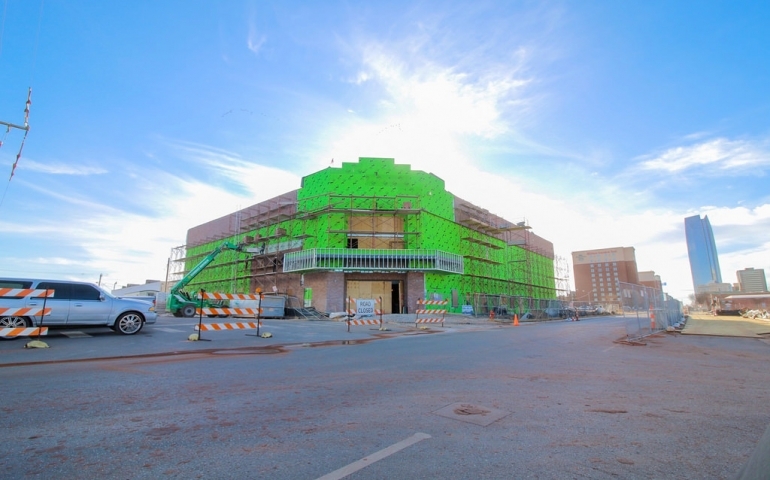 There’s a new venue here in Oklahoma City being built, and with that brings a new era in music for Oklahoma City. The Criterion is located in the eastern parts of downtown Oklahoma City. The venue won’t have a bad seat in the house and holds up to 4,000 guests. The Criterion has 8 shows posted for this spring and all are available to buy tickets. There will be a variety of different types of genres and artists, so let’s take a look at what’s in store for the spring. Ben Rector–March 26 @ 7:00 p.m.
Ben Rector, from Tulsa, Oklahoma, is a pop artist with a purpose. A smooth voice, great piano/electric piano sound and just an easy listen. Whether, you want to roll the windows down and sing at the top of your lungs, or if you want to put your headphones on and reflect on life, Ben Rector has written hundreds of songs and has a song for you. Tickets are General Admission – Standing Room Only, and are on sale for $22.00. The Let’s Dance Tour: Featuring Silento–April 1 @ 7:30 p.m.
Let’s Dance is a U.S. concert tour featuring today’s most popular hip-hop choreographed dance music. This show has featured and owned the dance world with hits like “Watch Me (Whip/Nae Nae)”. If you want to “hit the Whip and Nae Nae” with Silento at the Criterion, this show may be for you. Tickets range from $40.00 to $95.00 depending on if you want Standard Admission or the VIP Meet & Greet. Third Eye Blind–April 2 @ 7:00 p.m.
With hit songs like “Semi-Charmed Life,” “Jumper” and “Never Let You Go”, this will be a packed house. If you have an urge to hear some live music and hear some classic hit songs, I highly recommend this. Tickets are General Admission for $30.00. Kirk Franklin–April 8 @ 7:30 p.m. It doesn’t get much bigger in the gospel world today then Kirk Franklin. This will be a hot ticket, as local churches will be buying them up. Standard Admission tickets are ranging from $29.50 to $75.00, and there is a Meet & Greet Package with Kirk Franklin for $125.00. Rick Springfield–April 9 @ 7:00 p.m. This might not be the most appealing artist to go see this spring at the Criterion, but he does have a classic hit in “Jessie’s Girl”. Standard Admission tickets are ranging from $35.00 to as much as $85.00, and there is a Meet & Greet VIP Package with Rick Springfield for $225.00. My Morning Jacket with Special Guests: The Barr Brothers–April 27 @ 7:00 p.m. This is a show I am buying tickets to see. My Morning Jacket is an indie rock band who established themselves in 1998. They have a strong following of people and pack out their shows. If you are trying to find new music and want to see a great show, this could be the headliner of this list. Tickets are General Admission for $30.50. Disclosure–May 13 @ 7:00 p.m.
Disclosure will be an end of the semester show I will be attending. Besides the previous artist above, this might be the show I am most excited about. With hit songs like “Latch” featuring Sam Smith, this will be an electric performance. Tickets are General Admission and are going for $32.50. Randy Rogers Band–May 21 @ 7:00 p.m. This is a couple weeks after classes end, but what says summer like some country music? If you’re in town and want to go two-stepping, here’s an opportunity to do it with the Randy Rogers Band! Tickets are General Admission and only $20.00. The trips to Dallas and Tulsa among other places are not as needed anymore with the Criterion. For more information, go to criterionokc.com or email me at chadlock@mail.snu.edu. Next PostIntramural Drafts: What’s So Special?